Also there does not seem to be a "dose-response" for talc, unlike with known carcinogens like tobacco where the more you smoke, the greater the risk of lung cancer. But it adds: "Ovarian cancer is a rare disease, and increasing a small risk by a third still gives a small risk. So even if talc does increase the risk slightly, very few women who use talc will ever get ovarian cancer." The jury in Ms Fox's case deliberated for five hours before finding Johnson & Johnson liable for fraud, negligence and conspiracy. The award constituted $10m in damages and $62m in punitive damages. "This case clearly was a bellwether and clearly the jury has seen the evidence and found it compelling," said Stanford University law professor Nora Freeman Engstrom. "The jury was distressed by the company's conduct." However, she said the size of the award was unlikely to survive. "Big jury verdicts do tend to be reined in during the course of the appellate process and I expect that to be the case here," she said. 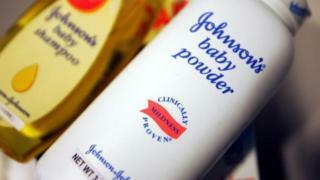 Cancer Research UK says evidence for a link between talc use and ovarian cancer is "still uncertain". "Even if there is a risk it is likely to be fairly small," the charity says. Ovarian cancer charity Ovacome says causes of the disease are still unknown but are likely to be "a combination of many different inherited and environmental factors, rather than one cause such as talc". It says that in 2003, results of 16 studies involving 12,000 women showed that using talc increased the risk of ovarian cancer by around a third, and that a 2013 review of US studies involving 18,000 women had similar results for genital, but not general, talcum powder use. However, it warns that studies of this type "can suffer from bias" and there were "uncertainties" around the results. "A large well-designed American study in 2000 involving nearly 80,000 women found no link between using talc and the risk of ovarian cancer," it says. The charity says that even if using talc does raise the ovarian cancer risk by a third, "to put it into context, smoking and drinking increases the risk of oesophageal cancer by 30 times".